Mooi nieuws dus voor die groep van patienten die in aanmerking komen voor dit middel. At the time of the second interim analysis, the median duration of follow-up was 26.4 months. Median PFS was 25.3 months (95% confidence interval , 23.0–30.3) for ribociclib plus letrozole and 16.0 months (95% CI, 13.4–18.2) for placebo plus letrozole (hazard ratio 0.568; 95% CI, 0.457–0.704; log-rank P=9.63 × 10−8). Ribociclib treatment benefit was maintained irrespective of PIK3CA or TP53 mutation status, total Rb, Ki67, or p16 protein expression, and CDKN2A, CCND1, or ESR1 mRNA levels. Ribociclib benefit was more pronounced in patients with wild-type versus altered receptor tyrosine kinase genes. OS data remain immature, with 116 deaths observed; 50 in the ribociclib arm and 66 in the placebo arm (hazard ratio: 0.746; 95% CI, 0.517–1.078). The ORR was 42.5% versus 28.7% for all patients treated with ribociclib plus letrozole versus placebo plus letrozole, respectively, and 54.5% versus 38.8%, respectively, for patients with measurable disease. Safety results, after a further 11.1 months of follow-up, were comparable with those reported at the first analysis, with no new or unexpected toxicities observed, and no evidence of cumulative toxicity. Heel goed nieuws voor borstkankerpatienten met hormoongevoelige gevorderde borstkanker. (ER pos. en PR pos. en Her2 negatieve receptorenexpressie). Zowel Palbocibib (zie eerdere publicaties hierover) en Ribociclib , twee gelijkwaardige zogeheten CDK4/6 inhibitors / remmers geven veel langere progressievrije tijd in vergelijking met alleen femara. Het statistisch significante verschil in ziektevrije tijd op 18 maanden bedraagt al 44%. Totaal doen aan de studie 668 patienten mee met hormoongevoelige maar Her2 negatieve gevorderde borstkanker. De onderzoekers noemen de resultaten van de twee grote fase III studies: MONALEESA-2 trial en de PALOMA-2 baanbrekend en zullen op korte termijn zorgen voor een verandering in de behandeling van hormoongevoelige borstkanker. Uit een vooraf geplande interim analyse hadden 234 vrouwen een doorbreking van de progressievrije ziekte (progressie van de ziekte of overlijden; 70% van de verwachte gebeurtenissen). Na een mediane follow-up van 15,3 maanden werd statische significantie bereikt door het verschil tussen combinatiegroep van letrole plus ribociclib en alleen letrozole - femara in het voordeel van de combinatiegroep. Na 18 maanden was de progressievrije tijd 63% voor de combinatiegroep versus 42.2% voor letrozole - femara alleen, feitelijk een verbetering van de progressievrije tijd met nu al 44% welke statistisch hoog significant is (P = .00000329). Mediane progressievrije overleving is in de combinatiegroep nog niet bereikt terwijl die voor de letrozole - femara groep alleen 14,7 maanden bedraagt. Nieuwe standaard behandeling voor gevorderde borstkanker? The inhibition of cyclin-dependent kinases 4 and 6 (CDK4/6) could potentially overcome or delay resistance to endocrine therapy in advanced breast cancer that is positive for hormone receptor (HR) and negative for human epidermal growth factor receptor 2 (HER2). In this randomized, placebo-controlled, phase 3 trial, we evaluated the efficacy and safety of the selective CDK4/6 inhibitor ribociclib combined with letrozole for first-line treatment in 668 postmenopausal women with HR-positive, HER2-negative recurrent or metastatic breast cancer who had not received previous systemic therapy for advanced disease. We randomly assigned the patients to receive either ribociclib (600 mg per day on a 3-weeks-on, 1-week-off schedule) plus letrozole (2.5 mg per day) or placebo plus letrozole. The primary end point was investigator-assessed progression-free survival. Secondary end points included overall survival, overall response rate, and safety. A preplanned interim analysis was performed on January 29, 2016, after 243 patients had disease progression or died. Prespecified criteria for superiority required a hazard ratio of 0.56 or less with P<1.29×10−5. The duration of progression-free survival was significantly longer in the ribociclib group than in the placebo group (hazard ratio, 0.56; 95% CI, 0.43 to 0.72; P=3.29×10−6 for superiority). The median duration of follow-up was 15.3 months. 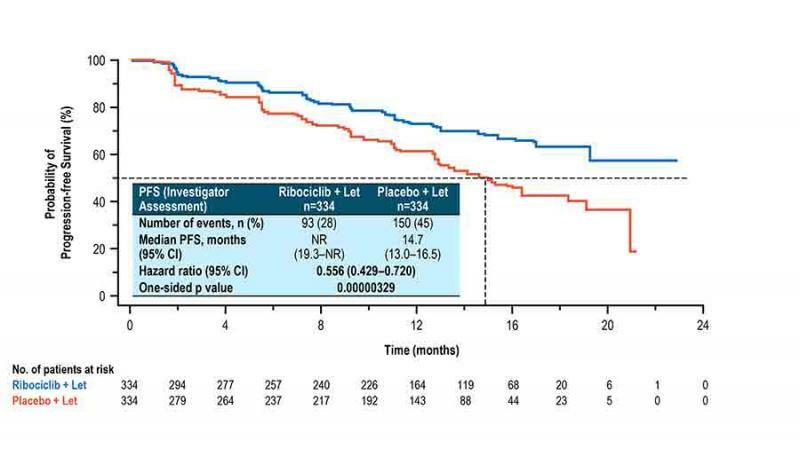 After 18 months, the progression-free survival rate was 63.0% (95% confidence interval , 54.6 to 70.3) in the ribociclib group and 42.2% (95% CI, 34.8 to 49.5) in the placebo group. In patients with measurable disease at baseline, the overall response rate was 52.7% and 37.1%, respectively (P<0.001). Common grade 3 or 4 adverse events that were reported in more than 10% of the patients in either group were neutropenia (59.3% in the ribociclib group vs. 0.9% in the placebo group) and leukopenia (21.0% vs. 0.6%); the rates of discontinuation because of adverse events were 7.5% and 2.1%, respectively. Reageer op "Ribociclib naast femara - Letrozole verbetert ziektevrije tijd op 18 maanden al met 44 procent versus femara letrozole alleen bij gevorderde ER positieve doch Her2 negatieve borstkanker."